In meetings and conversation, interrupting someone is often a power move. I’ll just let that claim sit there, unsupported, while you Google “linguistics and turn-taking” and “men interrupting women.” Don’t miss this informal study from tech culture by linguist Kieran Snyder and some good practical advice on how to make things better from Jessica Bennett. On my list of feminist concerns, being interrupted is a long way behind equal pay for work of equal value, but it’s at the top of my list of damaging workplace micro-aggressions. I loathe it. One of the fringe benefits, as I become more senior and earn roles of increasing authority, is that people interrupt me less. I hope I behave well in return, but that’s not what I’m musing about today. I’m looking back on a series of meetings, all one-on-ones, where I got tired of being interrupted. Coincidentally–I hope–these were all meetings where someone had come to ask me to grant them an exception or reverse a policy decision. They needed a favour, and somehow decided that the best approach was belligerence. In the first meeting, I quickly decided to explicitly ask my guest to stop interrupting me but, as I expected him to argue that he hadn’t been, I picked up a pen. I began quietly, unobtrusively but visibly jotting down a small tick whenever it happened. I continued to participate in the conversation when he let me, while tracking every time he jumped in on top of my words. I could bide my time to gather evidence. He wasn’t going to stop talking any time soon. But the confrontation I was preparing for didn’t happen. Around the time the tally crept up to five, he stopped interrupting me. I don’t know whether he worked out what I was counting or he finally read the look on my face, but he let me finish my sentences. A while later, I found myself facing another steamroller one-on-one. 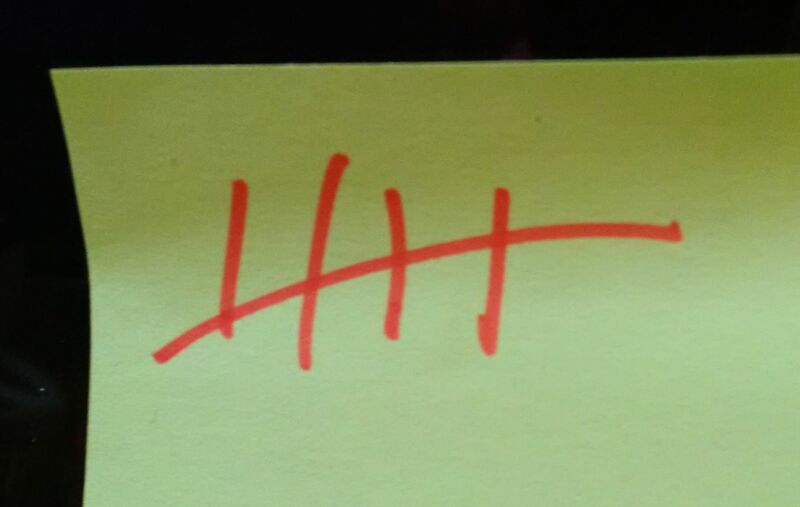 After fifteen solid minutes of never being allowed to complete a point, rather than lose my temper–or abandon it–I began another discreet but visible tally. This guy stopped, too. I think I’ve invented a behaviour-modification method that curbs interruptions. I am the clod whisperer. A few data points don’t amount to evidence. But I’m going to keep doing it and see what happens. If you do the same, I hope you’ll share your findings. If you do it in a meeting with me, I hope I’ll smarten up faster than five ticks.